Hi everyone. Here I am! :) It's been a while since I've posted a project. What can I say....busy busy busy. But...I was so excited to do up this image! Lizzy Love has been pumping out more and more digital stamps as well as rubber stamps and they are absolutely amazing! Click here to check out the Oddball Art Co Etsy Shop. If you use coupon code DTBAILEY10, you'll receive 10% anything in the shop! If you're interested in entering this challenge (Anything Goes) or any future challenges, check out the Oddball Art Co Challenge Blog or the Mixed Mediaology group on Facebook. 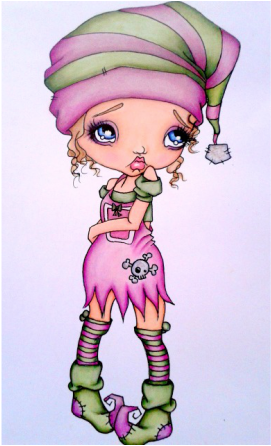 Adding a little extra to a colored image.....Oddball Art Co Design Team Project......love love love new digis! 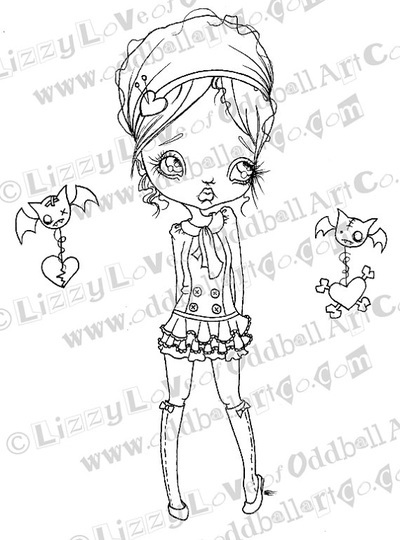 This is just one of the amazing new releases from LIzzy Love of Oddball Art Co. . There are a whole bunch of amazing digis available for purchase in the Oddball Art Co Etsy Shop. Plus....the prices are great! And then....for an even better deal, use discount code DTBAILEY10 to get 10% off anything in the shop! I used picmonkey.com to frost the edges, to add the text, and to create the border/frame.. Picmonkey has a ton of options for designing graphics, touching up photos, creating things like facebook covers, etc etc etc. The best part is that it's easy to use! This is a commissioned piece and my first time working with oil paints. Plus.....it's my first portrait. I can say...it wasn't easy. But I like a challenge. It wouldn't be very rewarding if it was easy. Looks like I'm heading in a different direction, huh? HIgh quality acrylic paints with metallic green and gold on a 30x40" canvas If you're interested in purchasing this piece, click here or visit my Art Dealer at leosdominiongalleria.com. I decided to do something a little different and share my process for coloring images. I used a digital stamp by Artist, Lizzy Love of Oddball Art Co. For the image on the left below, I colored it with copic markers (G46, G43, G40, E00, E000, Rv95, RV93, RV91, and a couple blues for her eyes). I used Letraset Promarkers for her hair. But....the colors aren't as vibrant as I'd like. The highlights and shadows could use some help too. So...I went over the copic-colored areas with colored pencils in similar shades, producing the image to the right below. As you can see, the colors are brighter and more defined. In addition to providing depth and definition, colored pencils also blend beautifully. I use a white Priismacolor pencil to go over the entire image to seamlessly blend all of the colors. The Priismacolor colorless blender is supposed to achieve the same result. However, I find that it leaves too much wax build up on the surface of the paper. So....the white pencil is my preference..
To purchase this or any other Oddball Art Co digii stamps, check out the Oddball Art Co Etsy Shop and use discount code DTBAILEY10 to receive 10% off anything in the shop. 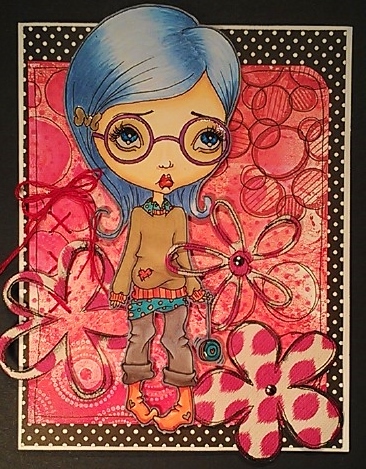 To enter Oddball Art Co challenges, visit the Oddball Art Stamp Co Challenge Blog or the Facebook Group Mixed Mediaology. Here's the process video for the Happy Holidays card in my previous post, which is my Oddball Art Co Design Team Project for December's "Anything Goes" Challenge. I show a masking technique, which allowed me to protect the focal image during the creation of the background. This mischievous little cutie is always up to no good.. Made it onto the Naughty List 4 years running! But....she hopes to come up with a plan. All images are by Lizzy Love of Oddball Art Co.. Check out the Oddball Art Stamp Co blog or Mixed Mediaology on Facebook. 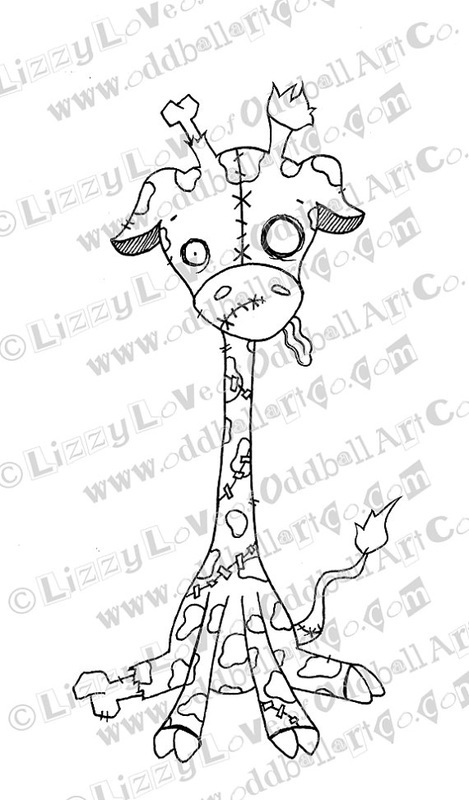 These digi stamps (and many, many more) are available for purchase in the Oddball Art Co Etsy Shop. Happy Halloween everyone!! Halloween is such a fun time of year for crafting. 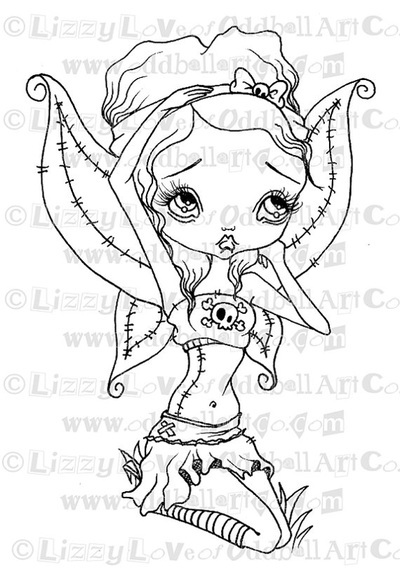 It's also a great time of year for creepy cute, big eyed digi stamps. What better time to give one of these little cuties a Halloween costume?! 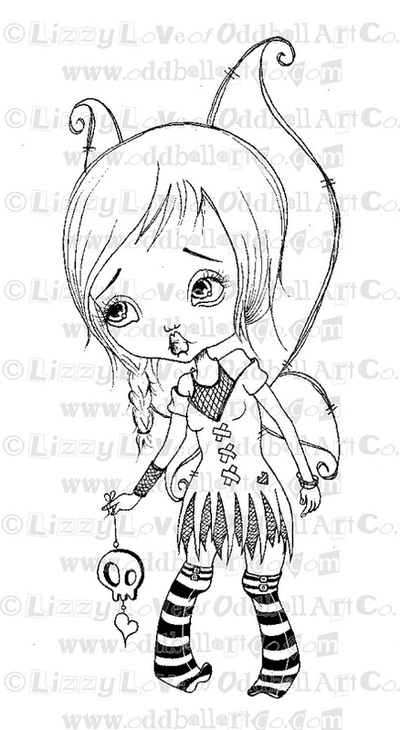 So....as usual....I go to my collection of digis by Lizzy Love - Oddball Art Co. I spread them all out on my desk and tried different combinations of images in different sizes until I found two that would work well together. The end result is a sad little girl in a fluffy sheep costume wearing high top converse holding a "Boo" balloon.. Sweet!!! 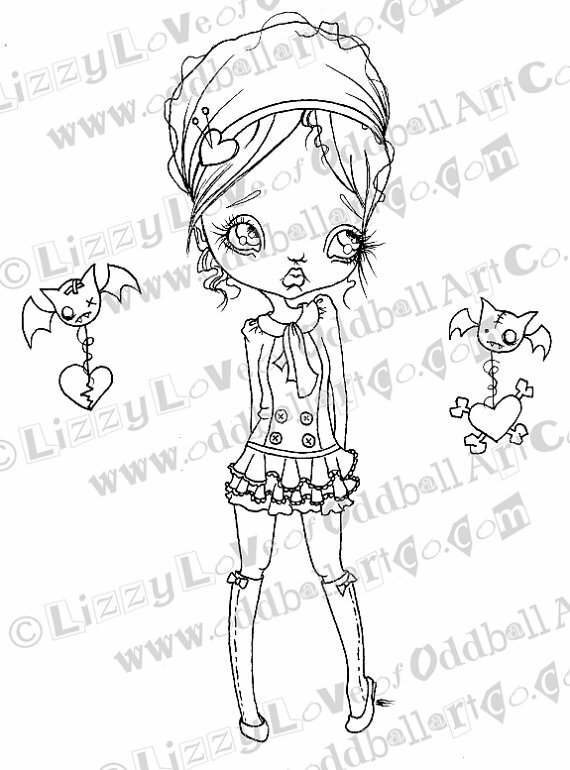 Lizzy Love comes out with new images every month, so ya never get bored with her stuff! 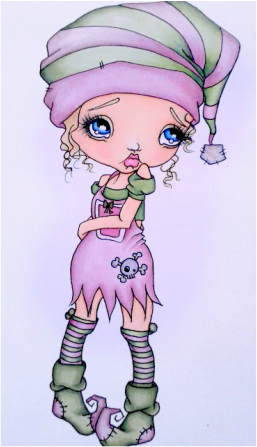 The digis can be purchased in the Oddball Art Co Etsy shop as well as Lizzy Love's original paintings, art dolls, accessories, art prints, etc. This shop is worth checking out! Use discount code DTBAILEY10 for 10% off anything in the shop! Yay! Halloween is such an exciting time of the year. Especially when you love creepy stuff like I do. The theme for this challenge is Anything Goes, which presented so many crazy, fun possibilities! I decided to challenge myself a bit and create something I had never done. So rather than color this digi with color, I only used black and shades of grey (Copic Markers in C1, C3, C5, C7, a blender, and black). This is one of my favorite Oddball Art Co digis. Well wait......I have so many favs. 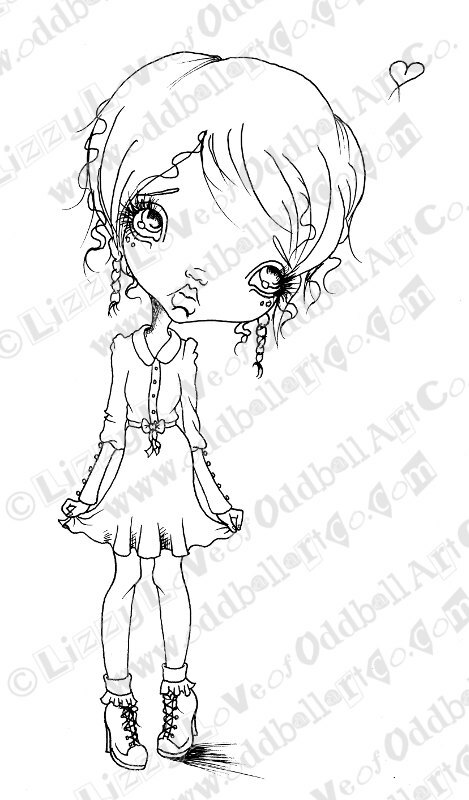 Artist, Lizzy Love, is coming up with new images every month anId I'm always so excited to see what she will create next. I encourage you to check out her Etsy shop where you'll not only see tons of amazing, creepy, cute, and unique digis, but her artwork as well. Really guys.....definitely worth checking out. If you're interested in entering this challenge, check out the Oddball Art Stamp Co blog or on Mixed Mediaology on Facebook. Another in my Day of the Dead series. I decided to make this one more girly, obviously. :) I used a combination of watercolors, acrylic paint, and Artist's Big Brush pens by Faber Castell. 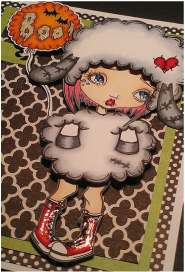 "hello" card made with Oddball Art Co digi stamp. This was intended to be a Halloween card, but would work for any occasion. The digi was colored with Copics and Letraset Promarkers. Background is simply patterned paper. This is the first in a series of Day of the Dead paintings. I absolutely LOVED creating this piece. The creative process of combining the different elements (eyes, nose, teeth, etc) and choosing the colors is lots of fun. Plus, it's like doodling on a larger scale but more intentional. If you like this piece, please.....hit "Like" or "Tweet" below and share on Pinterest as well. Thx! :) (click on pic to enlarge). P.S. This painting is for sale. I will be posting it in my Etsy shop. If you're interested in purchasing it before that, contact me and I will make other arrangements. Thx! I used some pretty cool techniques to create this 8.5x11" page. Click on the link below to see the step by step process. Shop Oddball Art Co on Etsy to purchase this digi and so so sooo much more. Use discount code DTBAILEY10 for 10% off. This is one of my favorites that I've created. It's a 12x12 canvas that began with a thick layer of gesso. I applied it with a palette knife and left the heavy scrape marks so that it gives the piece dimension. This painting contains a variety of media, such as watercolors, fluid acrylics, Delusions spray ink, Silks acrylic glaze, and gel paste, which is basically food coloring. I won't go in to detail about that just yet. 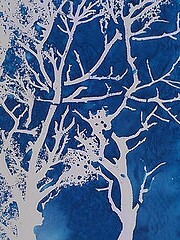 I plan on making a video for You Tube that demonstrates the versatility of gel pastes. Amazing stuff! The flourishes were made using a Faber Castel Artist's Big Brush Pen. The finishing touch was the outline of the heart. I achieved the dripping effect by first painting on black gel paste, then spraying with water. Once I got the "drippage" just right, I blasted it with my heat tool to dry it. These two pages were created for my art journal with the intention of actually doing some journaling on them. However, I really like how they turned out and decided to post them on this blog before I do the writing. Click on the pics to enlarge and for supplies used, click on "Read More" below. This painting is on a 12x24" canvas that was first prepped with gesso. I added layer upon layer of color in various designs. Between layers, I'd apply gesso, which allows for slightly transparent, hazy coverage so that the layer underneath can still be seen. I used a Faber Castel Artist's Big Brush Pen in white for the outline of the large flower then went over with gold Silks Acrylic Glaze. The inside of the petals has a translucent appearance, which was achieved by applying Dylusions Spray Ink with a paintbrush and water. Finally, the script that lines the top part of the flower reads as "For everything worth having, one must be willing to pay the price. The price is always hard work, patience, love, and sacrifice."